Technically, I wasn’t fired, I was laid off. Also, it won’t happen for another 14 months. And I wanted to get laid off so that I could collect a really nice severance package and take a sabbatical for a few months after it was all over, de-stress, and pursue the wine angle full-time for a little bit. The strange part about it is that if I’d agreed to relocate I would still have a very lucrative job at the same company – but after 13+ years, I’ve basically had enough of that high-stress corporate environment (making a very long story very short). Don’t get me wrong, I’m having some doubts. Did I do the right thing? Is the economy gonna pick back up? Can I make any real money doing this wine stuff? You know, the standard stuff: Man doesn’t like shore; Man leaves shore; Man loses sight of shore; Man practically pees himself for losing sight of the shore. So, let’s just agree that the title was a total bait-and-switch deal and move on, ok? As odd as it sounds, this was an occasion to celebrate, cholesterol numbers be damned. So we celebrated at Dude Central, to the tune of six bottles of wine (we did not finish them), all of them from the sample pool with the exception of the first wine (which was one from the personal stash). 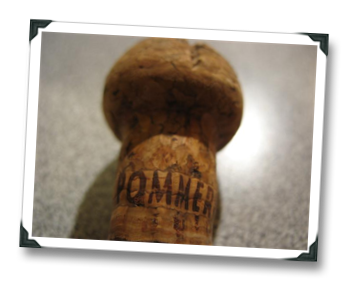 NV Pommery Champagne Brut Royal (Reims): I like my Champagne as yeasty as they can get, and this one delivers as it tastes like they tried to stick an entire loaf of bread into the bottle. Some nice overtones of flowers as well. But the fruit plays a minor role, so you’d better love bread action before you think about throwing down the cash for this. 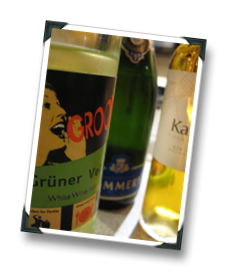 2008 Grooner Gruner Veltliner (Kremstal): What a great introduction to Gruner, and an affordable one too at around $15 (or less). 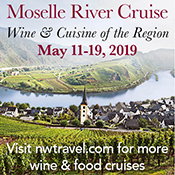 Wines like these – with citrus, bracing acidity, spice and garden-veggie aromas – are totally killer with salads because they compliment the flavors while cutting through the vinaigrette. Also stands up to veggie white pizza. 2006 Heron Hill Ingle Vineyard Riesling (Finger Lakes): Do you remember those commercials where the person stuck a big straw directly into a huge piece of fruit, as if they were going to drink the entire thing, pulp and all? This wine is just like that, only the fruit is an enormous lime. It’s a really solid offering from this consistent FL producer and I’d even go so far as to say that Heron Hill is starting to capture a sense of place, a terroir, from that vineyard location. 2007 Olson Ogden Wines Unti Vineyard Syrah (Dry Creek Valley): This is a hell of wine. It’s a big wine, but it’s the kind of ‘complex big’ wine (the finish moves from concentrated red berry to smoked bacon) that makes people who don’t like big CA wines do a triple-head-take move. It’s even better on day two if you let it sit and exercise sufficient restraint to leave some of it in the bottle for the next day. Give it four years in the bottle, then guzzle. 2006 Rockaway Cabernet Sauvignon (Alexander Valley): It’s really criminal to open this wine this early, when it so clearly needs 5+ years to fully round out the harsher tannins on the mid-palate. I know it’s a sample, and I’m supposed to do that, but it still hurts. There’s a lot going on on this wine, and it’s even better than the inaugural release that was bottled last year, which means (to me, anyway) that they really are sitting on some of the best fruit in Alexander Valley. But… it’s huge, it has ultra-concentrated dark fruit and spice, and the booze is really potent. It’s like that Apache Chief guy from the Superfriends cartoon, where he would say “Inyuk-chuk” and grow to some massive size – I felt like a glass of this wine was doing that at my dining room table, with black fruits growing so big they overtook the entire room. I know, I’m a weirdo. Anyway, if you can find this wine for under $70 I’d say you were getting your money’s worth. First off, yes, the title got me to click through! Personal stories are so interesting…however, your ability to write about wine is impressive. I can taste it–almost :). I agree about Rockaway. I have to say with all the hype,I was disappointed by this wine, especially at the price; perhaps it will drink better in a few years. I'm especially int'd in wines 2, 3 & 6, with wine #1 close by. I'll stop by Unti. Congrats on your future adventure! Thanks :-). 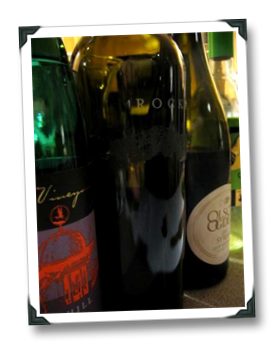 The Rockaway is very good wine, though at $75 I think it's a hair over-priced. Err, Congrats on being 'fired' in 14 months. I also work for the corporate man (think big bailout bank looking for new CEO). I also have been laid off. I also am looking forward to another potential lay off but I hope it isn't for another 2 years. My wife is going back to school and I'm pretty sure we can live on one income, but not zero incomes. We would miss our wines, unless somehow I could score on the sample list! Totally jealous! Cheers – and here's hoping for all the best for you! You worked in an Apache Chief reference? Niiiiiiice. I totally get the "wanting to get laid off" angle. This happened to my wife, and she had a few months of full pay with time to pursue her passions and start a company. It made me look at my 11-year stint at the same company and wonder…anyway, best of luck in your future pursuits. I think you definitely have a future in this wine scam. And, as Dale said, the Apache Chief reference (especially to describe a wine): pure rhinestone, man. Thanks, man! I am looking at this as potentially one of the best things to ever happen to me. Cheers! I want to see you succeed in such a big way with the wine gig, Joe. Anything I can do, in any small way, just lemme know! To start with, I bought your book. Boo-yah! thank you, brother! dude, I would have *given* you a copy of the book! Congrats, you will not regret it! I also dropped our of 'corporate' world just last year, and followed my dream, winemaking, full time. I am loving every minute of it. At any rate, life rarely affords us opportunity for a several months "vacation". It's a great forcing function to take a fresh look at things. Best of luck, and keep writing – I enjoy your writing style very much! I'm working at the same day job until Jan. 2011, then I collect the (fairly generous) severance package. Joe- Being laid off is the best thing that can happen to anyone who wants to get into wine! Big things are on your horizon! Way to go, man! I hope your new life is the perfect combination of work and fun and wine. That is to say a lot of all three. I was glad to have your wine there! I at least hope they weren't moving you someplace awesome like paris. Hello my name is Mamie Baker and I am a 20 year old Black Girl from Calgary, Alberta in Canada. I just got fired five weeks ago from my job at Tim Horton’s because I was phoning in sick to often, so I was fired because as they caught me lying as I wasn’t sick. Actually I was to lazy to go to work but that is nothing new for me as I am lazy anyway and have been fired from every job I have had for lying that I was sick.